Are you ready for new iPhone? 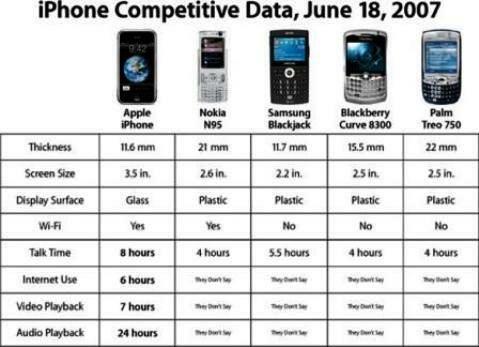 For your reference, here’s the latest corrected competitive data chart where Apple compares the iPhone to other smartphones including Nokia N95, the Samsung Blackjack, the Blackberry Curve 830D and the Palm Treo 750. For earlier version of the chart, Apple forgot that the Nokia N95 was WiFi enabled and stated that iPhone is the only Wi-Fi device in the chart. Anyway, the Apple iPhone still looks like the clear winner with an improved battery life as well as a more scratch resistant touch-screen. New Apple iPhone that available in 4GB model for $499 and an 8GB model for $599 will hit US market on 29 June, 2007.